Ana and I have been working with McCool every day over the last week, and Ana rode him for the first time on Friday. I rode McCool myself yesterday. He was a good boy. But I must say, I’m getting old. I really don’t enjoy that first ride on a horse that I don’t yet fully trust. When I was younger, I’d hop on any horse and just go with the flow. McCool has not been at all difficult. But he was good for his previous owner too and then after a couple of rides, gave her trouble. Particularly with any sort of repetitive work (he got balky and cranky). So I keep waiting for the other shoe to drop. I always wear a helmet of course. But I put on my crash vest too, which helps the confidence a little. Riders and horses have to learn to trust each other. 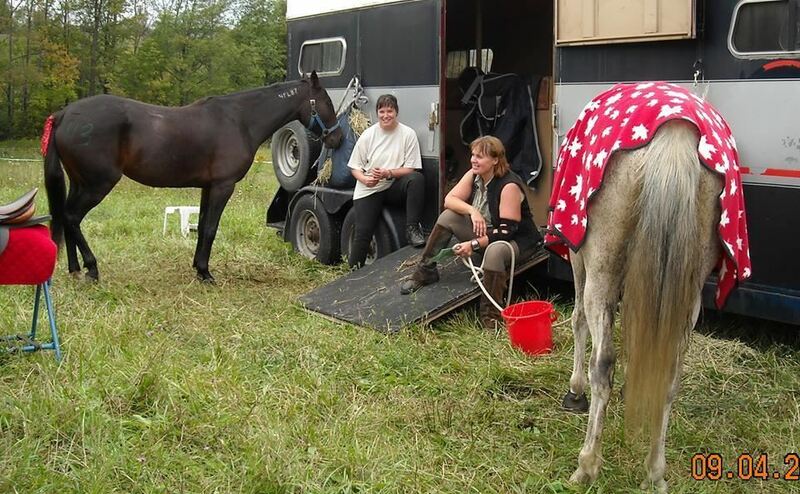 It sort of goes back and forth, from rider to horse, and back again, building on successes. That’s why ground work is important. Not so much because the horse is being trained to perform a particular action. But because the horse is learning to trust that this particular human is going to be clear, patient, and consistent, so they can let down their guard and learn. And at the same time the human is learning how the horse reacts to cues, what is likely to trigger problems, and how to help the horse to relax and focus. It takes me longer to trust a new horse, and to trust that my own skills are sufficient now that I’ve been humbled by a few horses over the years. I’ve done a lot of groundwork with McCool in the last week. I go out several times a day and do short sessions with him, and Anastasija generally does one session in the evening as well. You can eliminate a lot of variables using groundwork. But in the end, the only way to know how a horse will respond to being ridden, is to actually ride them. Ana does not have time to ride him every day, because she ponies (leads fractious racehorses from the back of another horse) at the track in the afternoon on racing days. So if McCool is going to get regular sessions, we have to share the task. First, I got on him in the round pen and worked on responsiveness to cues. Bending, circles, changes of direction, etc. I taught him the basic one-rein stop. At least the beginning of it. He was very quick to pick it up. Took only a few tries on each side before he was touching my boot at a light lift of the rein. So perhaps he’s been taught that at some point in the past. His backing is good, but a bit dull. So I really focused on the lightest rein cue possible and then throwing the reins the moment he softened backwards. Exaggerating the release as much as possible. I wasn’t even asking for a step, just a shift to the rear. And within a few minutes he was flowing backwards in a much nicer, soft reverse with a low head and hind legs underneath him. He doesn’t seem to understand leg aids very well. But he is very soft-mouthed. Although I didn’t test it much, I did think he was just slightly goosey about my right leg. So I will do some body work on him to see if he has a rib out or something. Veronica tacked up Ella while I was working in the round pen. And once she was ready, we went out for a short ride around the farm. All we did was walk. I just wanted to let McCool look around and see what his attitude was about it all. I was going to tuck him in behind Ella, but he thought she was much too slow, and went out in front. He marches right along, looking at stuff with interest. We went back, past Aunt Sue’s house, and around the back field, which borders on the golf course next door. He peeked curiously through the trees at golfers and golf carts. Ella crowded up on his behind at one point, and McCool backed up and hopped a couple of times to warn her. He didn’t connect, but he definitely told her off. While it’s not good behaviour on McCool’s part, it really looks good on Ella, who is very rude with her hind feet. I didn’t get after McCool too strongly, just warned him verbally and moved him along. He didn’t threaten again, but then he didn’t need to. Ella was quite a bit more respectful after that. When we got to the back corner of the field, there was suddenly the CRACK! of a golfer hitting a ball just on the other side of the tree line. McCool startled slightly and looked over his shoulder. “Holy cow!” he said, “what the heck was that?” Ella had also startled a little bit and rushed forward. So McCool decided that maybe he’d walk behind Ella for safety. That didn’t last long though, because Ella was still too slow. As we came back up the big hill, and big flock of turkeys wandered out into the driveway in front of us. I wasn’t sure if McCool saw them, because he didn’t react at all. So I sort of pointed his nose at them to make sure. He walked faster. Hmmm. Yep. He saw them. He dropped his head a little bit. Walked faster. The turkeys rushed off the side of the driveway. He turned his head and watched them. I think the little beggar was thinking of chasing them. At the mailboxes, we stopped and watched traffic for a few minutes to see how he reacts to cars. But he seemed to have no concerns. He was kind of interested in heading out into the great blue yonder. But I am not ready to take him that far yet. There’s still that little voice in the back of my head warning me that he has caused some trouble in the past. Young, sound, well-broke horses don’t usually end up at the stockyards if they’re perfect gentlemen. But each little success is a building block. So, I am not quite sure how this happened. But there’s a new guy here on the farm. His name is McCool. He’s an 8 year old Arab who had nearly run himself out of chances in life. He came off a rental string somewhere up north, and ended up at the stockyards. He had no name, no papers, and very little history. Someone spotted him, bought him, and had him delivered to a dealer who tried him, and found him occasionally balky and a bit difficult. So she (not having the time or the inclination to work through those sorts of issues) was going to send him to auction. 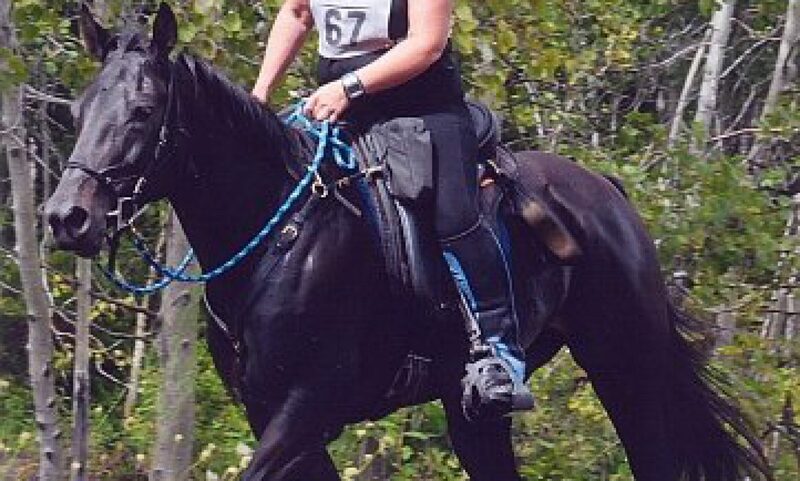 Canter On Equines, the rescue that found Wise Affair, sort of talked me into buying him to give him another chance. I brought him home Saturday evening. All week I’ve been trying to come up with a name for him. We tried and discarded quite a few. But McCool (after Finn McCool aka Fionn Mac Cumhaill, the Irish mythical hero) is finally the one that stuck. McCool is a confident, cool guy. He doesn’t fuss about being separated from other horses, is not easily startled, and is a smart as… well… smart as King actually. In fact he reminds me rather remarkably of King. Even in looks. Though McCool is smaller than King at 14.3hh. Anastasija is helping me with him. She’s been ponying at the racetrack lately in addition to her regular job as a groom, and her riding skills are coming along well with all the extra practice. Not to mention that she’s young and energetic (and has no recently broken body parts). After doing groundwork with him all week, Ana had a short ride today after his lungeing session. Just walk/trot in the round pen. It was incident-free, and he got tons of praise and scratches. All of which he loved, since he is a seriously friendly guy. It seems likely that he got sour as a rental horse. I am hoping that with consistent training and lots of positive reinforcement, he’ll enjoy his work a little bit more, and maybe we can find him a new, permanent home. He seemed pretty cheerful today anyway. So it’s a good start. Isn’t he a handsome fellow??? We took Ella and Diego up the the Massie Autumn Colours ride yesterday morning. It’s actually a ride ‘n’ tie, but Doug also puts on a short set speed ride at the same time. Veronica entered Ella in the 14 mile set speed, and I took Diego in the 21 mile. It’s a 7 mile loop repeated. Emily brought the fabulous Duke, so she rode with us, and so did Sandy on Benson (the world’s cutest Arab). Veronica’s helmet cover now matches her tack. Duke likes to lead, and he does it incredibly well. He power trots up and down hills, around corners, over logs, it’s all the same to Duke. This trail was very twisty and technical. The hills are steep and rock-strewn. Forest trails are very trappy, with lots of little roller-coastery stuff in between the big hills. Duke just seems to love that sort of terrain. He’s focused, forward, and happy. And you know… he’s not an Arab. He’s a Quarter Horse. Not so many of them in our sport. They tend not to have low enough heart rates. Duke though… he vetted in at 28. Diego was 36 and I was happy with that. 28 is just ridiculously low. The first loop went well. 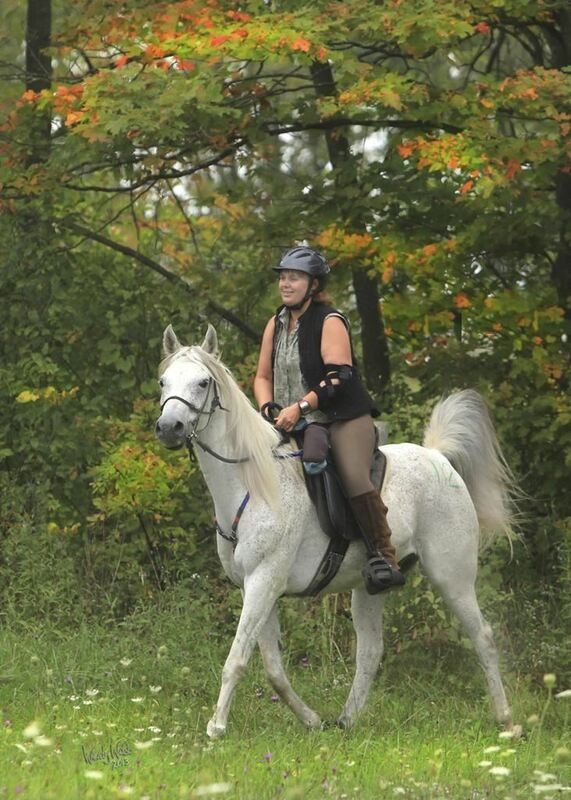 I think it was the fastest Veronica has ever ridden on trail. Duke was really moving along, and it was a lot of fun. We did 7 miles in 58 minutes. Diego cruised along behind Duke. He likes Duke because Duke is calm and confident. Diego (Mr. Insecurity) feels safe behind him. Benson came next (doing his dressage pony imitation), and Ella stayed at the back (where her ninja hind feet could do no harm). Being a Standardbred though, her turning radius is just a bit wider than optimal. She smashed Veronica’s knee on a cedar tree in one of the tight turns. Veronica barely even squawked. But it was a hard hit. All four horses vetted through fine. Diego was probably at parameter (56bpm) within a minute or two, but I didn’t rush to get his heart rate taken. So he was 48 at 5 minutes. His CRI (cardiac recovery index) was 44/40. All A’s for gut sounds, hydration, etc. On the second loop, Duke was still forging ahead in the lead. Diego was very happy to drift along in his wake. I sent him out in front for a short while, but then some enormous scary boulders threatened to eat him. So after pushing him past those for a while, I chose to give my legs a break and take him back behind Duke again. Small victories are nearly as good as large ones right? Ella managed to smash Veronica’s knee again. We all think it was even the same tree. At that point Veronica started looking rather pained. And Ella was looking a little foamy and frazzled by the middle of the second loop. She’s not used to that many hills and even less used to all that speed (she was an utter failure at just being a racehorse prospect… she never made it as far as actually racing!). So we slowed down a bit. Eventually Veronica elected to let her walk in the rest of the way. I figured Ella would be fine, since she’s such a confident, unspooky mare and we carried on. Though we listened carefully for a while to make sure that there was no chaos behind us. But Ella was not particularly concerned. Relieved to be rid of all the speed demons I suspect. We did that loop slightly slower in 1:05. Duke’s back was a bit sore at the final vetting, so his pulse was up to 40. Still good enough that he got a Grade 1 (the highest) completion. Sandy and Benson also completed in good shape. Veronica and Ella turned up while we were still in our hold. They also vetted through fine. Ella was cooled down and relaxed after walking in the last couple of miles. So she was in good shape. However, she did make a bit of a rep for herself in the vetting area. She tried to both kick AND bite the vet. And did manage to kick Veronica. Luckily just a glancing blow, but still enough to make Veronica hopping mad. Ella really was particularly rude with her hind feet. We are sort of wondering if the previous day’s events had something to do with that. My border collie, Jimi, nipped her heel, and she lambasted him (it’s hard to blame her). Jimi went off yelping, obviously stung, though he was fine after a few minutes (she got him in the upper thigh). Veronica’s husband, Brian, suggested that Ella might have been pretty impressed at how effectively she’d routed the dog, and was thus emboldened to use those feet a bit more. Whatever the reason, we are going to have to do a whole lot of dry run vet checks at home in the next little while. And likely a chain shank over the nose at real vet checks for everyone’s safety. After the 14 miles was done, Diego had to go back out and leave all his friends. He’s still herdbound, so I knew that was going to be a bit tricky. As soon as he realized he was alone, before we even passed the start line, he had a little nervous breakdown. Shook his head, reared a couple of times (slow/low rears, not too scary). He is not a strong-willed horse, so he did go out, albeit reluctantly. Within half a mile, he had decided that if we had to do this, then we should just get it over with. And from that point on, he got down to business and traveled. For the much of the loop, I had him on a loose rein, trotting and cantering the winding trails. Practicing our neck reining, and enjoying the spectacular views. It is a fun trail to ride, and really keeps you interested and looking ahead. Normally I hate repeating a loop even twice, much less three times. But at this ride, it’s too lovely to be bored. I expected to lose quite a bit of time on that loop, since I thought we might have to walk quite a long way (or maybe crab sideways while not allowing him to gallop back towards camp, bucking…). But after that first half mile of somewhat jittery walking, he committed himself to the task and we moved out at a respectable pace. I was extremely pleased with him and he did a lot of ear flicking listening to me telling him what a grand horse he was. We ended up doing the loop in 1:11. He came into the finish trotting and quite relaxed on a loose rein. Veronica came over with Ella, so he pulsed down quickly. He was at 52 for his parameter check and 44 for his 30 minute vetting. However… he was a bit lame. I pulled off his boots in case there was a stone in them. He was still off. Marg was standing there watching, and she pointed out one of the boots. The back edge had gotten folded inwards and jammed. Sure enough… when the vet checked that spot, Diego was very flinchy. It had bruised and rubbed the heel bulb. It’s not a serious injury, and we got a completion anyway. He should be fine within a day or two. Fold is visible along the back edge. Note the masses of red ribbons in Ella’s tail. Warning to man and beast alike! I get email notifications whenever the boss’s horses work. And this morning, what do I see? That’s my boy!! Monster… his first clocked work!!! William is always a good boy (despite being a bit of a worrier). Monster, not so much (and he doesn’t care one bit if you’re mad either). He’s been giving the riders a bit of hell lately. But apparently he decided to behave enough today to actually move along. I hope his rider stayed aboard throughout:-) I’m sure I’ll get the whole story this evening from the boss. I don’t seem to have had too much to write about lately. But I did have a nice moment with Diego on Sunday. Was riding in the Vivian with friends. One of the horses was green. Really very green. He bounced around on the trail like a pinball, careening from side to side. So we tucked him in behind Diego, and Diego just ambled along the trail on a loose rein. Whenever Indy (the wild child behind us) got too ambitious and tried to careen past us, I asked Diego to step over and block. Which he did with perfect aplomb. Diego really doesn’t have confidence in the lead. But he also walks really fast. So he slows down until the horse behind passes, then gets impatient and passes again when he discovers that horse is too slow. I ask everyone who rides with me to tell me when they want to pass, so that I can ask Diego to slow up… as opposed to allowing Diego to make his own decisions about it all. On Sunday he only tried it a couple of times and then just marched along out front the rest of the day. So I think his confidence is coming along nicely. 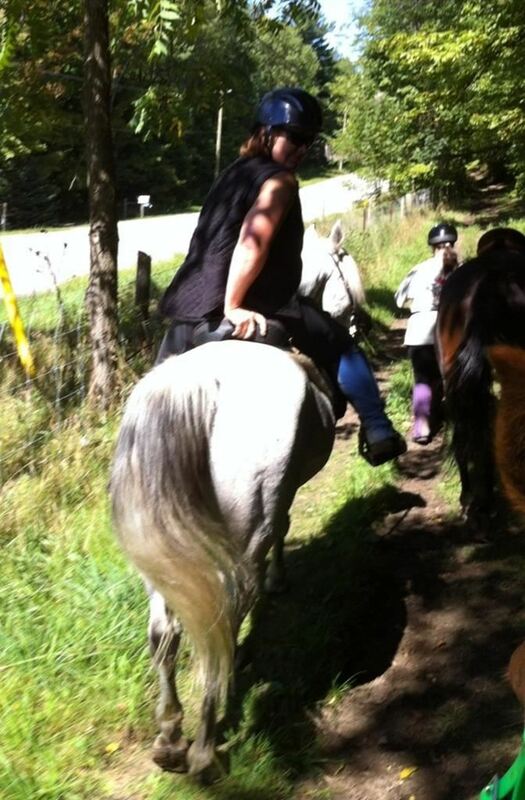 Riding Diego in the Vivian Forest… Veronica and Ella ahead of me. Veronica and Ella spent most of the day riding drag (at the back of the line). It’s safer that way, since Ella has not yet learned the “no kicking other horses” rule (actually, I think she knows it… she just hasn’t accepted it quite yet). But it’s really her only flaw. She is rock steady on trail. Veronica’s confidence has blossomed this summer, riding that mare. They are becoming a very good team. At one point we let Indy lead for a while to see how he coped. I think that little gelding would’ve gone off alone perfectly happily. One of these days, he’s going to make a terrific little endurance horse. Unfortunately though, going down a very steep downhill, in deep sand, with quite a bit of erosion, there was a tack incident. Stirrup and breast collar somehow tangled, and the resulting chaos sent Indy off trail… cartwheeling downhill. Indy got loose and galloped off, with his buddy, Zoe, following a bit too fast for her rider’s comfort. Diego and I watched all this in wide-eyed horror. I decided that a cavalry charge down a steep sandy hill was not in anyone’s best interest, and asked Diego to walk. He tucked his behind under him, and carefully walked down. No fussing or rushing. Ella was following safely behind us (Ella never thinks rushing is a good idea). 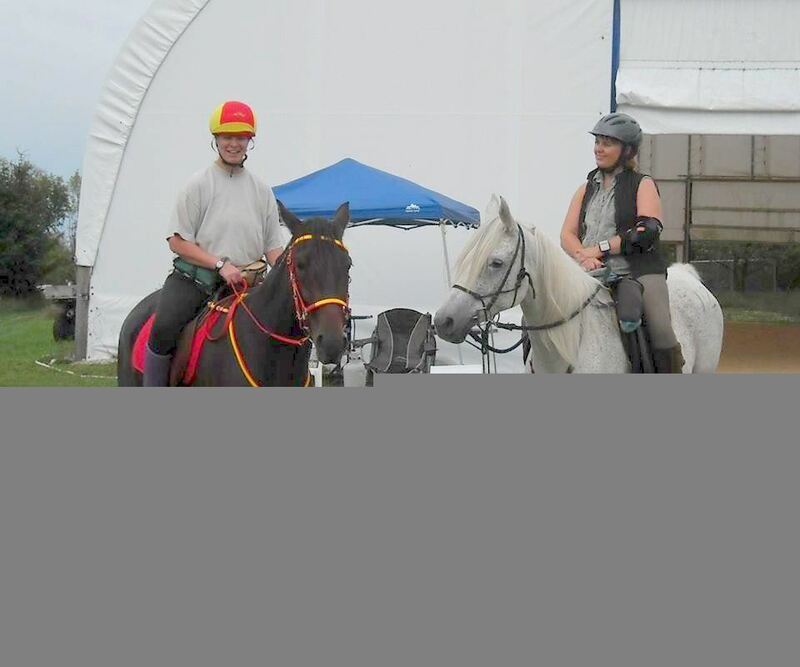 He stopped at the bottom and stood calmly on a loose rein while Indy galloped off in all directions for a few minutes before his brain re-engaged and he elected to return to his rider. During all this chaos, a large, obnoxious woman on a Percheron bellowed unhelpful instructions to slow down and demanded to know where our trailers were (my friend finally lost her temper and told the woman to mind her own business). It turned out that Zoe’s bridle had come partially undone, so that’s why her brakes stopped working. And both Indy and his rider were fine. In fact I think the rest of us were a lot more shaken up than either of them. The large woman went off in a huff, informing us that we should not call her if we ever needed help. Sigh.